All vehicles stop momentarily (ittanteishi 一旦停止) to check for approaching trains, before crossing railway level crossings even if the barrier is up and the lights are in their favour. This stands in contrast to the fact that even in Japan one is not required to stop ones vehicle momentarily to see if anyone is running a red light at green traffic lights. Once a long time ago I asked a Japanese university professor why this is the case. He suggested that it could be due to the emperor system (which was his axe to grind) such that common folk are required to pay respect to any representative of Japan (such as JR trains) since they are also therefore representatives of, or represented by, the "symbolic emperor". At the time I thought, "surely not" but upon reflection it occurs to me that this practice of paying deference to representatives of the state has a long history. Consider the Namamugi incident of 1862 where four Britons who refused to dismount to allow the procession of the Lord of Kagoshima (then Satsuma) to pass where attacked by attendant samurai swordsmen who expected deference from commoners, even British ones. Far further back in time the Wajinden or 'Records of Wei', written by Chinese visitors to ancient Japan in the early 6 century, recorded the fact that commoners would move to the side of the road and bow at the passing of aristocracy. 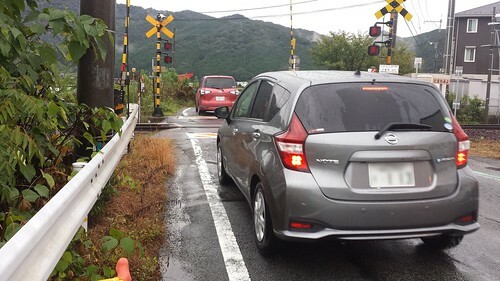 1500 years later the Japanese are still paying their respect to the passing of representatives of the polity, in the form of trains at level crossings. From a logical point of view, I can see how it could be more important to stop at level crossings rather than at traffic lights if the vehicle stopping has the power to derail the train containing large number of people, resulting in large number of causalities. This could happen in the case of trucks and large cars, but it is difficult to imagine in the case of light cars, and surely cyclists would be simply swatted off the rails like mosquitoes should they venture onto the tracks at an importune time.